Currently MetaRouter can be used in the RB400 series boards and PPC boards (RB1000, RB1100). 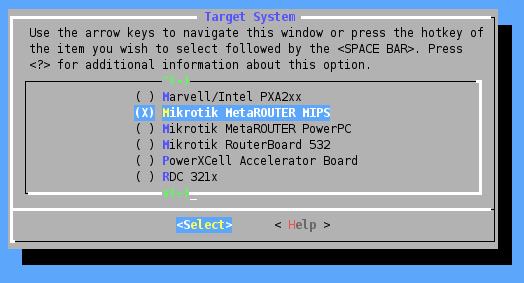 Each Metarouter instance uses the same amount of resources as a stand-alone RouterOS installation. It means that you need a minimum of 16MB of RAM for each RouterOS virtual machine plus memory for the MetaROUTER host itself. It is suggested to have more than 16MB memory available for each Metarouter. Upcoming RouterOS versions will have ability to run virtual machines with less than 16MB per machine. Note: It is possible to run other virtual machines with less than 16MB RAM per machine if the virtual operating system is OpenWRT. The 16MB limitation is only for virtual RouterOS installations.